First off I am sorry to have to report the death of Joe Bellino ’61, great halfback for Navy and its first Heisman Trophy winner. His bio can be found by searching in the Boston Globe. When he was a second class he turned down an offer to play pro baseball and retured to Navy for his first class year when he won the Heisman. He was a really class guy. He retired as a Captain after 28 years in the Navy and Naval Reserve. Our lunch this month will be on Thursday, April 18 at Guy Hollerin’s Sports Bar in the Holiday Inn at Plymouth Rd and Hwy 23 in Ann Arbor at 1130. If you can please email back for a reservation or call me at 313-885-2174. Last minute attendees are always welcome. Our March lunch will be on Tuesday, March 12 at Beau’s Grillery, 4108 West Maple Rd; Bloomfield Hills 48301 at 1130. Please Email back if you can for reservations. Last minute arrivals are always welcome. With the new year we are going to add a new location to our lunch rotation with a lunch location on the East side. We will start that next month. For our January lunch we will meet on Tuesday, January 15, 2019 at The Clawson Steakhouse at 56 South Rochester Rd. in Clawson 48017 at 1130. Please email back for a reservation if possible, but last minute arrivals are always welcome. See you for lunch and enjoy the Dark Ages! The Army-Navy Game Party is just around the corner, 13 days as I write this. It looks tough for us this year, but always remember, anything can happen in the Army-Navy game!! We need to hear from you if you are going to attend. You can email me to let me know at arthurwbryant@gmail.com. Family and friends are welcome, so see you at George Murphy’s. Details are on the flyer attached. Please do not forget Dues payments for 2018. The following members are paid up. Good on ya!. Send checks made to USNAAA-Det Ch. to Art Bryant 1811 Hollywood; Grosse Pointe Woods, 48236. After a great win over Army, our Monthly lunch will be on Thursday, December 13 at 1130 at The Dearborn Inn’s Edison Dining Room. The Dearborn Inn is located at 20301 Oakwood Blvd; Dearborn 48124. If possible, please RSVP back by email to help us with reservations. This is not a good year for Navy football. We are 2 and 7 on the season, and Army is 7 and 2. The only way to make it a winning season will be to BEAT ARMY!! With that in mind, attached and below is the flyer for Army-Navy game party for our two alumni groups and relatives and friends. I apologize for not putting the following info on the flyer: “George Murphy’s At The Creek” is located on the Fox Creek Golf Course one mile West of Farmington Rd on 7 Mile Rd. BEAT ARMY!! Our November lunch will be on Tuesday, November 13 at Guy Hollerin’s in Ann Arbor at Hwy 23 and Plymouth Rd at 1130. Please email me back at arthurwbryant@gmail.com for reservations if possible. This Month’s lunch will be on Thursday, October 11, 2018 at Beau;s Grillery Restaurant at 4108 West Maple Rd in Bloomfield Hills 48301 at, PLEASE NOTE, 11:45. (They do not unlock the doors until 11:30.) Please email back for a reservation if possible, but it is not necessary. Dec. 8 Army-Navy Game Party with Army as host at George Murphy’s Restaurant in Livonia. More info very soon. Navy football started off with a loss to Hawaii 59 to 41. But last week we came back with a big 13 point rally in the 4th quarter and beat Memphis 22 to 21. This Saturday there will probably be a lot of rain when we play Lehigh due to Hurricane Florence. Our Sept. lunch will be on Tuesday, Sept. 18 at The Clawson Steak House at 56 South Rochester Rd in Clawson MI 48017 at 1130. Please email me at arthurwbryant@gmail.com for a reservation if possible, but not necessary. Dec. 8 Army-Navy Game Party with Army as host at George Murphy’s Restaurant in Livonia. More info later. This month’s lunch will be on Thursday August 9 at the Dearborn Inn’s Edison Dining Room at 1130. It is located at 20301 Oakwood Blvd in Dearborn 48124. If you can attend please email back if possible for a reservation, or call me on 313-885-2174. Due to several requests and some map work, we are going to add an east side location to our rotation after November when I-696 is completed. Any suggestions on a restaurant would be appreciated. Don’t forget dues of $20 are due. 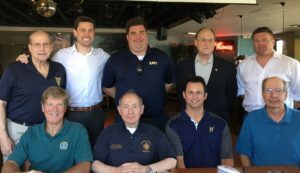 On Monday, July 9 we had our Monthly lunch at Guy Hollerin’s Sports Bar in Ann Arbor. We had one new member Jerry Maniscalco ’07 who just recently moved to Ann Arbor after leaving active duty and will be attending business school at U of M for the next two years. It was also good to see Latham Gravatt ’00 again. He works very close to our Ann Arbor location. We had a lot of discussion on first deployments and best assignments. The June lunch will be on Monday, June 11, 2018 at Beau’s Grillery Restaurant at 4108 West Maple Rd. in Bloomfield Hills 48301 at NOTE 1145. (They do not unlock the door until 1130.) Please email back for a reservation if possible, but not necessary. The 4 Day All Academy Challenge resulted in $800,000 for Navy from 3500 donors! !